The reception of patients is no longer a difficult task and hard to the doctors of Jenin Hospital at Al-Shijaaia district as it was before, when the charitable hospital used to close its doors against the patients due to the unavailability of electricity to make the medical equipment fully operative. The hospital working hours were only associated with the availability of power , which is 8 hours a day , and whenever the power is OFF the hospital closes its doors and the doctors go back home . But, the Jenin hospital returned to working mode after the Sunshine4Palestine Association provided, installed, and operated the Jenin hospital with a solar module that converts the solar energy to electrical energy that lately provided the first floor of Jenin hospital with even more than the needed electricity to make it fully operative. “The assembly of Sunshine4Palestine association has been established and thought of right after the 2008-2009 war on Gaza , as we have with some Italian scientists and supporters of the Palestinian cause eagerly searched for ways to help the Palestinian people ” Said Eng. Haitham Ghanem , the director of Sunshine4Palestine association in Gaza . The Sunshine4Palestine Association is led by its CEO Dr. Barbara Capone an Italian scientist and the project leader, and Dr. Ivan Coluzza , an Italian Scientist and the project Coordinator, Haitham Added . 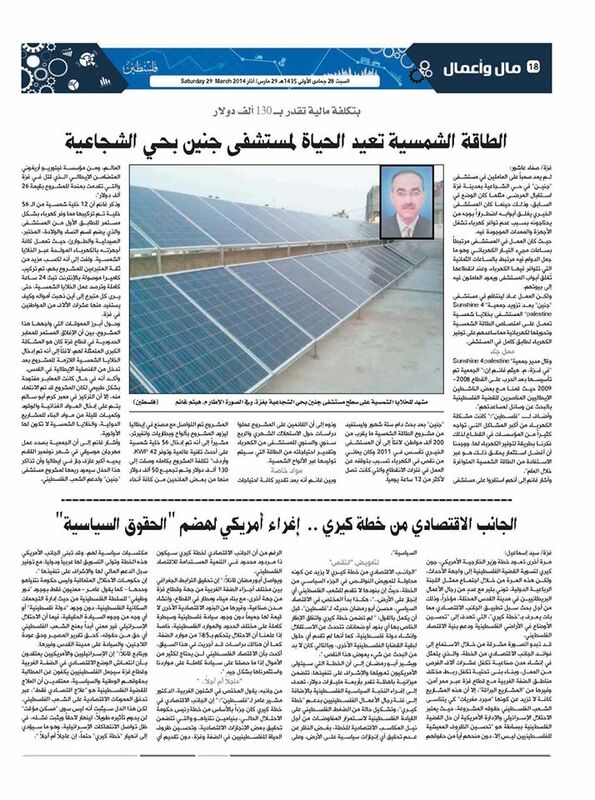 He added, “The electricity shortage is the biggest problem that faces almost all the institutions in Gaza strip, that’s why we thought of ways to help those institutions to overcome that problem, and we agreed that the best investment to achieve this is through taking advantage of the almost all year available solar energy”. Ghanem pointed that they have settled on Jenin hospital after a long six months of searching, in order to help almost 200,000 residents that lives in the neighborhood of Jenin hospital by making the hospital fully operative during the year and to be able to provide the people with all the medical services needed. He mentioned that Jenin hospital was established in 2011 and continuously suffer from the shortage of electricity that recently makes it not operative for almost 12 hours a day. He also noted that those who technically worked on the project studied the monthly, quarterly, and the annual electricity consumption of the hospital and precisely estimated its energy needs, which will be generated through the solar panels. Ghanem added that after estimating all the project’s technical needs, we as Sunshine4Palestine contacted an Italian factory to submit us with the photovoltaic solar panels, the Inverters, and the batteries, pointing that we managed lately to let enter 56 highly technological photovoltaic panels, and one smart inverter, and at the end of the project the plant will be able to produce 42KWP. He continued, “the entire cost of the project amounted to be 130 thousand dollars and managed to collect 50 thousand dollars from great supporters all over the world, and here , I would like to show our gratitude to Vik Utopia Onlus , the foundation created to honor Vittorio Arrigoni, the peace activist and supporter who was assassinated in Gaza that granted us with funding to cover the first modulus” . Ghanem said “we just mounted 12 panels out of the 56 panels that continuously providing the hospital’s first floor, with all its departments, with the needed electricity. The Department of Obstetrics and Gynecology, laboratory, the Pharmacy and the emergency room with all its equipment are fully operative with the electricity generated by the solar panels. In order to earn all the donors and supporters trust we at Sunshine4Palestine association decided to mount a digital Web Camera and made it connected to the internet for 24hours a day, in order to globally broadcast the work implementation steps to every donor and to prove where the money went and how it is benefiting tens of thousands of citizens In Gaza “. Among the main obstacles we faced and still during the project is the continues closure of the boarders in Gaza strip that caused us a big problem and we finally managed to let it in after the help of a local company that we managed to purchase the needed materials from after the closure . He stressed that if the crossings borders are open regularly and in daily basis, the project would have completed long time ago, but the focusing on using Karm Abu Salem Border to be mainly for food, fuel and for construction materials for International projects only, have made the solar cells to be of no Priority. At last, the project manager pointed that the Sunshine4Palestine association is determined to help the humanity everywhere, and that the association is preparing for a big musical concert in Rome / Italy that will be next fall and will host an exceptional musician. This entry was posted in Palestinian Press. Bookmark the permalink.